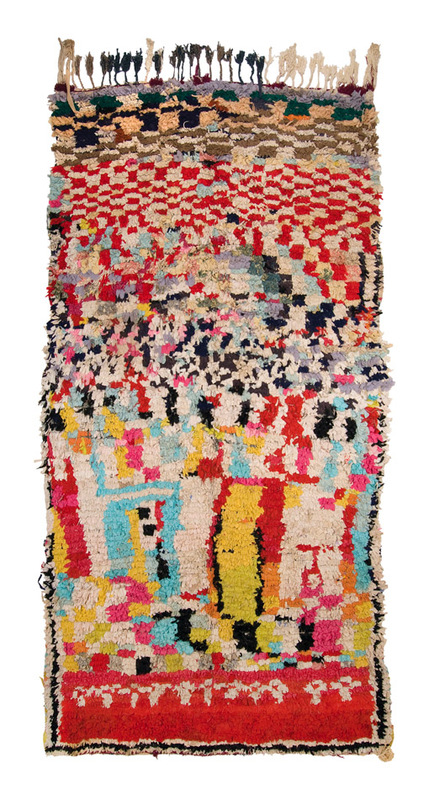 Cavin-Morris is pleased to present our third selection of Amazigh (Berber) rugs in our ongoing program of exhibiting important indigenous art and design. The previous two exhibitions; Rags to Richesse and its follow-up were limited to the Boucherouite or rag rugs made by women for use in their own homes. This exhibition continues the series but adds important examples of antique wool Berber rugs in order to create a dramatic aesthetic counterpoint of tradition and innovation. 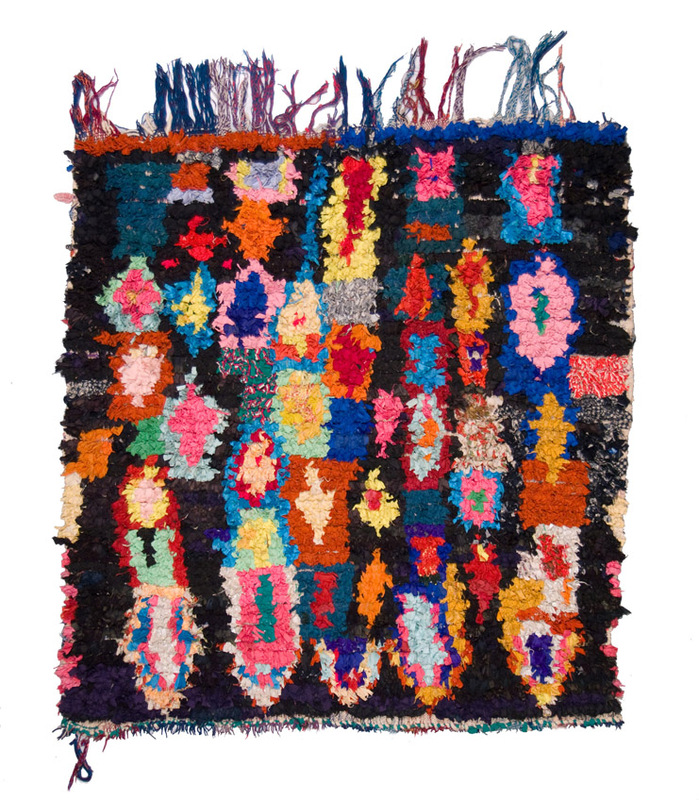 At first glance the makers of the contemporary rugs seem to have stepped beyond the reins of tradition and eschewed the past because of the intensity of their colors and the newness of their textures. The opposite is true; these rugs represent an expansion of tradition, a lesson in how culture adapts and survives. The older rugs have less color but their patterns and lines are as meaningful and wild as those in the later rugs. It is instructive to understand the historical reality of what Moroccan history has been in the Twentieth Century. Much of current Amazigh life is a response to French colonialism. Morocco has not been frozen in an Orientalist vision of Western standards of authenticity. The Amazigh people have to a large extent, remained freestanding of the Arab culture. In this case the Mountain did not go to Mohammed. They have maintained their language. The center of this resistance and retention has been not of traditions, as much as identities, and it is a fact that the Amazigh women are still the foundation of that cultural identity. For any number of reasons she has been the center of the language, the imagery, the rhythms of the life despite uprooting, despite urbanization, despite deep Colonialism. Carpets are made for home use and are seen as indicators of a woman’s versatility and control of the hearth. Textiles carry valences of fertility. Metaphor and hidden meanings are intrinsic facets of storytelling. Wool was so important when it was accessible that it became a metaphor of spiritual force itself. It is symbolic of the benevolent functioning of Nature: wool happens because God gives rain. Wool is an end result of God’s fecundating Nature. This is why its recycling was always more than a mere economic factor. The power of wool gives the act of weaving a ritualistic aspect. Once the warp threads are attached the textile is born and now has a soul. It moves through the phases of life in the weaver’s process. Weaving is a life force. We have been fortunate enough to find another group of great and authentic rugs not made for the commercial market. Many rag rugs are made but they are not all automatically great or important. We were able to surf the wave of encroaching commercialism to find these in conjunction with the connoisseur and dealer of Berber art, Gebhart Blazek. The great rugs are getting harder to find. This is the golden moment for connoisseurship of these weaving. As life changes, the meaning of Time in these women’s lives will pick up a different cadence and as the need for financial survival increases, less time can be spent on personal pursuits. These rugs were made for the internal heart of their culture, and that heart is beating and in the flux of change. In the future something will be sure to shift and displace the focus they naturally give these artworks now. Something no less integral. Something always does. It will not be inferior, but it will be different.